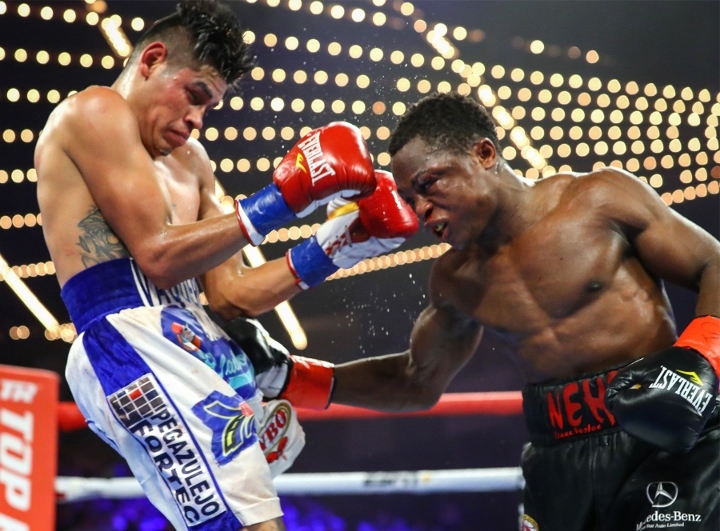 Former world champion Isaac Dogboe was having a fantastic 2018 and was hoping to close out the year with a bang, but instead he was upset in December when he lost his unbeaten record, and his WBO super bantamweight world title. Dogboe lost a 12-round unanimous decision to the much bigger Emanuel Navarrete, who entered the ring as a very big underdog. According to the once-beaten boxer, he plans to make changes. He intends to move his training camp to California and hire a nutritionist. Dogboe is now focused on rebuilding his career, and working back to the point where he was – in line for bigger money fights and opportunities. “I could have done better. But all in all, what happened has already happened. The most important thing is looking over it and just working towards a different goal. Working towards rebuilding myself and getting back into that groove. I’ve already spoken to Bob [Arum, his promoter], we expressed to him the challenges I faced during training camp in terms of injuries and challenges with weight loss. So right now they are going to add a nutritionist to the team. Just keep working,” Dogboe told Boxing News. After getting everything in order, Dogboe is eager to get Navarette back in the ring for a long-awaited rematch. “We’ll see how I feel at the weight [and if I beat him I’ll] still chase after the unification and hopefully move up”.